CJOB-FM, then a country music station, first began using radio broadcast automation around 1971. This “computer” enabled only two announcers to do most of the programming. We called it a computer, but it really wasn’t. At best, it was a robot. It was electro-mechanical, not digital. These types of machines were in wide use between 1965-1980, when real computers took over. We called our early radio broadcast automation robot “Stanley”. The name was both a noun and an expletive. While I don’t have an exact picture of Stanley, I found this photo on the web and it comes very close. Early radio broadcast automation machines like Stanley were comprised of five components. Music tapes. Large open reel players, shown above on the right, contained hours of music. They were recorded well in advance and catalogued with an identification number. Each tape was accompanied by a sheet of paper listing each tune on the tape, in order. At the beginning and end of each tune, the tape contained a sub-audible tone. This tone, typically 25-75 Hz, had two functions. When it began, it signaled to the machine that the tune was ending. When it stopped, it also stopped the tape player so it was cued up for the next tune. These were large, heavy tapes. The tape players, typically made by Scully, had to be carefully aligned in order to handle the weight. Starting and stopping was controlled by relays. There was also a special sub-audible tone to signal the end of the tape so it would rewind automatically. Voice track tapes. A smaller open reel player, shown above on the lower left, contained the announcer’s introductions. It also used sub-audible tones to signal when the machine should start the next tune or commercial. The announcer would record a voice track for a six hour show in a very short time. He or she would sit in a recording booth with a playlist of tunes and a button to insert tones on the voice track tape. The process was simple: announce a song, push the button to insert the tone, release the button and announce the next song, push the button again, and so on. 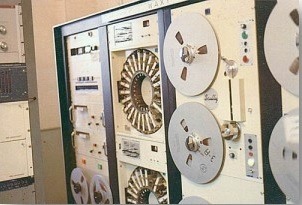 Typically, the switching between the various music playback tapes was hard wired in advance and followed a set ratio. If there were four music playback machines, the announcer had to remember where he was between four different playlists. One mistake would screw everything up. And often did. Live content cartridges. Several small cartridge tape players, shown above on the middle left, were used to insert live content at selected times. Since the program’s voice track was recorded hours, or even days in advance, there had to be some method for adding new material. These live content cartridges could be used to insert weather, sports, news and community announcements. Commercial cartridge carousels. Stanley had two carousels, shown above in the center, which each held up to 24 commercial tape carts. The machine knew how to rotate, insert carts into a player, and withdraw carts from the player. Sometimes there were not enough slots available in advance of a long program, so cartridges would have to be swapped in and out. Programming logic. The commercial carousels and live content cartridges were programmed in advance using a matrix of pin holes. The rows of this pin board represented cartridge numbers in the carousels. The columns represented time or sequence. The top carousel was “red” and the bottom “white.” Red or white metal pins were inserted (white ones were longer) to tell the machine what to do and when. Think of playing the game Battleship and you will get the idea. The programming logic was contained in a tray between the two carousels. The thing to remember is that all the planning and thinking was done before you started Stanley going. Once in action, it was 100% mindless and completely unable to adapt to anything that might go wrong. And therein lay the challenge. I would estimate that something (other than human error) went wrong about 10-15% of the days in early radio broadcasting automation. In 1971, the decision was made to use early radio broadcast automation on a simulcast of both CJOB AM and FM. My overnight shift ran from 11:00 p.m. to 6:00 a.m. I was responsible for setting up the robot, doing live or recorded news, weather and sports, and monitoring Stanley’s performance. My actual on-air responsibility started at 12:05 a.m. when the hourly newscast ended. The half-hour was spent setting things up. The challenge was programming Stanley for the night shift while he (it?) was still running a country music show on CJOB-FM before midnight. This involved loading the commercial cartridges in the carousels, and programming the logic. Then, as midnight approached, I had to begin removing the country music tapes and replacing them with easy listening music tapes for the overnight simulcast. Since these tapes were huge, so they took a few minutes to rewind. Finally, I had to replace voice track tape. There was a lot of pressure between roughly 11:55 and 12:05 (sharp!) to unload the old stuff and mount the new stuff. Most days, this was done with only seconds to spare. Remember, there was no margin for error in loading the tapes since the voice track was pre-recorded and the announcer was at home in bed! Early radio broadcast automation had a well known set of problems. Sometimes, the sub-audible tones did not work properly. I remember occasions when the voice track tape tones failed to catch, and the entire six hours of musical introductions started to run without stopping. This was really bad. When the tones failed on a music tape, the worst outcome was just continuous music. When the tones failed on a voice track tape, you were completely exposed. So was your audience. A more frequent point of failure was audio tape breaking or jamming, or the open reel machines breaking. Preventative maintenance included religious cleaning of the playback heads and capstans. If the tape snapped, you had to splice it on the fly. I remember once standing in front of Stanley, splicing the tape on the top open reel player. I looked down to see that the bottom player had jammed and miles of tape were piling up around my feet. Occasionally, one of the two carousels would jam. That wasn’t so bad, as you could skip commercials and make them up later. Infrequently but often enough, the announcer recording the voice track would loose track of what he was doing. Things like skipping over a song he was supposed to announce, or doing so in the wrong order. This was not hard to fix. You just needed to figure out the mistake and then re-synchronize the tapes. Finally, after reading the 5:30 a.m. newscast, I had two very important jobs. The first was to make a fresh pot of coffee for Red Alix, who did the morning show on CJOB AM. The second was to re-program Stanley on the fly with the country music morning show for CJOB-FM, which started at 6:05. This was the reverse of the pressure filled hour before midnight, with the same set of challenges. So there is a snapshot of radio broadcasting automation in its earliest form. Most days when my shift ended, I was just happy to go home unscathed.